Housing developments are threatening the survival of wetlands and wildlife in Melbourne’s booming western suburbs. Our reporters find their way to the headwaters of a vulnerable waterway on the city’s outer fringe. For full multi-media report, click here. In the countryside west of Melbourne, the abandoned fields by Middle Road, Hoppers Crossing have been overrun by withered yellow weeds. Piles of rubble block the roadway. Skeleton Waterholes Creek begins right here, with rocky ditches and a series of puddles. It’s a long way from the the scenic waterfalls or idyllic winding streams people might imagine when they think of headwaters. 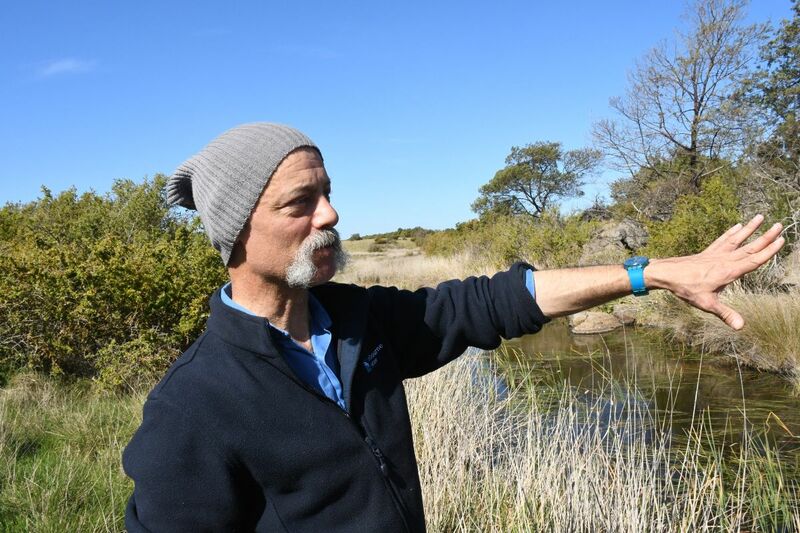 Gerard Morel, waterways and land officer for Melbourne Water, explains why. After the farmland was abandoned, the area –far from supervision – became an easy dumping ground for industrial waste. Morel says volcanic rock lies kilometres below the land upstream, acting as a natural filtration system for stormwater. When it rains, the water seeps out, slowly forming the waterway. Aptly named, the creek consists of a series of shallow pools only connected by water during the rainy season, leaving a skeletal outline on the ground when dry. The landscape was once a “temperate Kakadu” surrounded by sea, rivers, creeks, lakes and lagoons, historian Meyer Edelson explains. But now the natural bushland has been threatened by development, which is “devastating” and “insurmountable” in Morel’s words. As one of the founding members of Friends of Skeleton Creek, Denice Perryman feels the same as Morel. She says development “has gone crazy the last 10 years”. Nowadays, with the rise of public environmental awareness and ecological legislation, the creek is recovering gradually from human interference. Under government requirements, land developers have reconstructed some sections with native vegetation and stone features. Many of the reconstructed sections are now enjoyed by the communities they pass through, with peaceful jogging paths and thriving wetlands. But Morel says getting residents to value the creek can be challenging. Some locals have filed complaints about the native vegetation, asking for tidier parkland. Until the 1990s it was common to manage waterways by containing them in pipes and concrete ditches. The concrete pipes manage flood surges really well by whisking the water away fast – vegetated natural creeks slow the water down. However, pipes and concrete obliterates life in the creek and Melbourne Water has moved away from that and manages flooding now in more holistic ways. Natural features and native vegetation also act as a filtration system. Melbourne Water now insists that all stormwater be passed through a form of filtration before it hits the creeks, often passing through man-made wetlands that act as a filter. The land along the creek was once fertile and supplied rich resources to the local Indigenous groups and habitats to sustain wildlife before European settlers moved in. The bushland provided abundant food for migratory shorebirds from Siberia, giving them energy for the homeward journey. The vegetation and rocks protected the Growing Grass Frog, an endangered frog species once found near Hopper’s Crossing. The creek flows on: from catchment in Tarneit to the wetlands where the creek meets Port Phillip Bay. In 1836, the sheep brought in by settlers destroyed the native plants. Since then, the ecological balance has been disrupted. Some native plants no longer exist in this region. The yam daisy’s habitat was destroyed by excessive farming and an invasion of introduced species. While some restoration has occurred, plants like the yam daisy may never return. “Yam daisy is so vulnerable and tiny, and we’ve got such a vast area to restore,” Morel says. He believes that under the pressure of urban expansion it is impossible to fully restore the natural environment. Fast-moving developments, such as the dusty and flat Verdant Hill in Tarneit and the gated community of Sanctuary Lakes, both have promised to be part of potential environmental projects, but neither responded to our interview requests. As Skeleton Waterholes Creek winds through Altona Meadows, you can see the hard work by government workers and volunteers. Protection tubes hide tiny seedlings struggling to grow along the creek banks. Towering phragmites, a native type of reed, are booming in the shallow waters along the creek’s edge. Morel is proud of the work done to restore the area, saying that what matters is encouraging local communities to care and feel connected to their environment. Housing developments are beginning to loom along the waterways in Mount Cottrell and Tarneit. Skeleton Waterholes Creek is not the only one in a battle between conservation and development.